Have you noticed that many membership sites offer three options, such as the Bronze, Silver and Gold, or the Essential, the Premium and the Platinum..? However they name them, the levels of membership sites tend to come in threes. Great orators also know that when they say things three times, audiences tend to latch on more strongly to what they say. And good writers often put things in threes as well – to emphasise, to clarify and to convince. Whoops…! Just did the “three thing” myself…! Sales people also know the “rule of threes” – they give people three options. There’s the really cheap version, the hugely expensive option and then the middle alternative. The idea is that people will buy the middle option because they think the cheap one is, well, “cheap” and they think the expensive item is, well, “expensive”. So by offering these two polar extremes it seems to force people to choose the middle option. On membership sites, too, people tend to go for the middle option – not the bronze or gold, but the silver option (or whatever the middle alternative is called). Now, new research confirms several earlier studies which demonstrate that we do indeed “plump” for the central choice. If you want to sell something online you can make people much more likely to buy if you offer it in three alternatives – colours, flavours, shapes, whatever. But, this new research shows that people will be much more likely to select the middle choice if you list them horizontally OR vertically with the one you want people to buy being placed in the middle. So, that means any imagery you use in your e-commerce sites, or online catalogues should always have at least three options, with the one in the middle being the most profitable for you. The research suggests this is the one people would be most likely to buy. Graham this is a very helpful post. I’m in the process of creating a new membership scheme for Virtual Assistants and I just assumed that people would go for the bronze. However, this article makes complete sense. If I look at the options I’ve always gone for it’s been the middle! Hi Carmen – glad to have helped..! Best of luck with your membership scheme. Interesting article and yes I to seem to have often gone for the middle (silver or whatever option). For no reason at all I was thinking about the US election and how commercial it is and how each candidate is “Marketed” and “Sold” to the electorate. I realised that there is only two options for voters, either Democrate or Republican, Black or White. Perhaps they are missing a trick and should have a middle (or Centre) option? 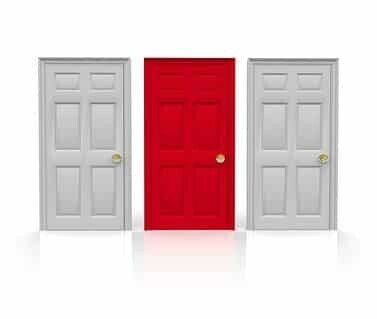 You may be right – there is some evidence that people find it hard to choose when they only have two options.